Are antacids like Pepcid & Zantac the best solution available for Asian glow? In recent years there has been widespread misuse of antihistamine medications such as Zantac, Zyrtec and Pepcid AC to alleviate symptoms of Asian Flush, or Asian Glow. This article examines the evidence supporting this method, discusses the long-term health implications involved and how to prevent Asian Glow. There are various types of antihistamines on the market today but none of them are specifically created for Asian flush symptoms, or Asian Glow. However, many people who deal with Asian Glow know that some types of antihistamines can help with their alcohol intolerance symptoms, especially red facial flushing. Famotidine - Commonly sold under the trade name Pepcid, Pepcid AC or Pepcid Complete. Famotidine is a histamine H2 receptor antagonist that inhibits stomach acid production. While most people know these medications for treatment of heartburn, it is often used for peptic ulcer disease as well. Ranitidine - Found by the trade name Zantac. Ranitidine is also a histamine H2 receptor antagonist that inhibits stomach acid production. Zantac is also commonly known for heartburn but it can also be used in the treatment of peptic ulcer disease and Zollinger–Ellison syndrome. Cetirizine - Sold under the trade name Zyrtec. Cetirizine is a second-generation antihistamine (makes users less drowsy) and is used in the treatment of hay fever, allergies, angioedema and urticaria. It is a racemic selective H1 receptor antagonist. Fexofenadine - Fexofenadine is also classified as a second-generation antihistamine like Cetirizine. A selective peripheral H1-blocker, Fexofenadine is often used to treat common allergy symptoms like hay fever and urticaria (hives) and is usually known Allegra. Allegra is a second-generation antihistamine, like Cetirizine, which means it's less likely to make you drowsy like traditional antihistamines. However, it's still advised that mixing Allegra and alcohol can cause the user to become more tired than expected and possibly dizzy. As with all medications, antihistamines come with side effects that the user should be aware of, even without using them to combat alcohol flushing symptoms. When used for their designed use, a lot of the antihistamines mentioned have similar side effects. Of course, medications impact everyone differently as well. Zantac side effects, like Pepcid, are uncommon and are usually mild. Some side effects you may experience with Zantac are things like stomach pains, constipation and nausea. Like Pepcid, Zyrtec carries a lot of the same side effects, like fatigue, dizziness, headache, nausea, dry mouth, among others. An important side effect to keep in mind for all of these antihistamines is fatigue or drowsiness, especially if you intend to drive. As mentioned, second-generation antihistamines (Allegra and Cetirizine) tend to be less likely to make you drowsy, but it's still a possible side effect. This problem can be compounded when also consuming alcohol and taking one of these antihistamines for use against alcohol flushing. Mixing things like Zantac and alcohol means that both the alcohol and the antihistamine can make you drowsy together. Discussed below are clinical trials linking the action of antihistamines to one or more symptoms of alcohol flush reaction. As mentioned above, antihistamines were not created specifically for alcohol flushing, or Asian Glow symptoms, but is there a link that antihistamines can safely be used for this condition? A 1988 study headed by N.S Miller, author of “The Pharmacology of Alcohol and Drugs of Abuse and Addiction”, examined the role of histamine in the expression of alcohol sensitivity in oriental subjects. One-half of the test subjects in the study were given 50 mg of a H1 receptor antagonist similar to Zyrtec and 300 mg of a H2 receptor antagonist similar to Pepcid AC and Zantac. The second half were the placebo group. The clearest difference between the antihistamine group and placebo group was in their degree of erythema. The antihistamine group showed a significant reduction in skin redness and also showed lower levels of systolic hypotension from the administration of alcohol. A subsequent 2004 study aimed to look at why Japanese asthmatics experience exacerbation of asthma symptoms after alcohol consumption. They found that the alcohol by-product acetaldehyde increased airway muscle tone and made it harder for subjects to breathe. This was associated with an increase in the release of histamine. A H1 receptor antagonist similar to Zyrtec was able to reverse this effect. Obviously laboured breathing, or restricted breathing, is a serious symptom of alcohol intolerance and shouldn't be ignored. For those that experience this symptom (especially those already with asthma symptoms) should check with their doctor about their alcohol consumption. Is Sunset more effective than Pepcid AC at fighting Asian flush? John Dao from California, USA had this to say about Sunset Alcohol Flush Support: "Sunset Alcohol Flush Support gave me a second chance to having a social life without going through hell. I've tried other anti-histamine products and none works as well as Sunset. In fact, I went on a 4 days all-inclusive resort destination wedding the other month and drank alcohol everyday with the support of Sunset and it worked wonders. For the first time, I drank alcohol and had a good time with family and friends without having to worry about really bad Asian Glow and other side effects. I love Sunset!" 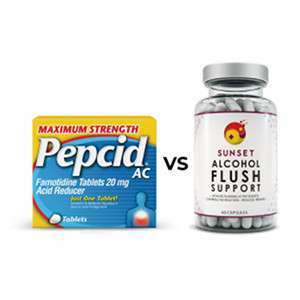 Can you use antacids for alcohol flush? Generally speaking, combining Pepcid AC, Zantac or Zyrtec with alcohol is not safe for people with alcohol flush reaction. The is because these methods mask symptoms of acetaldehyde exposure without solid evidence of a significant reduction in blood acetaldehyde. This allows ALDH2 deficient individuals to consume more alcohol and increases their risk of acetaldehyde toxicity. Daryl Davies, current director of the Alcohol and Brain Research Laboratory at the University of South Carolina, stressed in a recent article that alcohol flush reaction is the body telling the drinker to slow down and commence hydration. Essentially, there are a few health factors to consider here when using medications like Pepcid for Asian Glow, or drinking alcohol with Asian flush. When taking an antihistamine to reduce facial flushing, drinkers may not realise that they are consuming more alcohol than usual and exposing themselves to a high level of toxic acetaldehyde. Because they are not experiencing the usual red face, they may think that they can consume more alcohol without any negative symptoms. If they continue to drink, acetaldehyde will continue to accumulate in their system, exposing them to a group 1 carcinogenic for a long period of time. We've also discovered that between people who drink comparable amounts of alcohol, individuals with one copy of the inactive variant are about 6-10 times more likely to develop esophageal cancer than people with the fully active enzyme. So even though they may not experience red facial flushing from using an antihistamine such as Pepcid, it will not shield them from the possibility of developing esophageal cancer. Are there possible alternatives to Pepcid AC, Zantac and Zyrtec for the attenuation of Asian flush symptoms? When researching how to prevent alcohol flush reactions, a potential alternative to antacids and other antihistamine medications is an amino acid called N-acetyl cysteine or "NAC". Unlike Pepcid & Zantac, NAC does not act to reduce alcohol flush reaction by controlling histamine release, but rather blood acetaldehyde levels. A 1995 study aimed to examine the role of N-acetyl cysteine in attenuating alcohol-related hypertension in rats. The scientists found that N-acetyl cysteine, an analogue of the dietary amino acid cysteine, binds acetaldehyde and works to prevent its damaging effect on physiological proteins. The effect of Pepcid, Zyrtec and Zantac on Asian flush was discussed in light of evidence linking "off label" antihistamine use to symptomatic relief. A small number of clinical trials have shown that antihistamines similar to Pepcid AC and Zyrtec may alleviate symptoms such as erythema (skin redness) and restricted breathing. Despite this, it seems clear that the overarching health concerns of using antacids and other antihistamines with alcohol outweigh the slight improvements seen in symptoms. Further research is required to identify whether antihistamine medications work to decrease blood acetaldehyde levels, or whether they only offer symptomatic relief that can mask serious long-term health threats. Miller NS1, Goodwin DW, Jones FC, Gabrielli WF, Pardo MP, Anand MM, Hall TB (1988). "Antihistamine Blockade of Alcohol-Induced Flushing in Orientals". J Stud Alcohol. 1988 Jan;49(1):16-20. Kawano T1, Matsuse H, Kondo Y, Machida I, Saeki S, Tomari S, Mitsuta K, Obase Y, Fukushima C, Shimoda T, Kohno S (2004). "Acetaldehyde Induces Histamine Release From Human Airway Mast Cells to Cause Bronchoconstriction". Int Arch Allergy Immunol. 2004 Jul;134(3):233-9. Epub 2004 Jun 1. Brooks PJ, Enoch M-A, Goldman D, Li T-K, and Yokoyama A. (2009). "The Alcohol Flushing Response: An Unrecognized Risk Factor for Esophageal Cancer from Alcohol Consumption". PLoS Medicine. Vol. 6 No. 3: e1000050. World Health Organization International Agency For Research On Cancer Lyon, France (2009). "IARC Strengthens Its Findings On Several Carcinogenic Personal Habits and Household Exposures". Press Release. No. 196. Vasdev S1, Mian T, Longerich L, Prabhakaran V, Parai S (1995). "N-Acetyl Cysteine Attenuates Ethanol-Induced Hypertension in Rats". Artery. 1995;21(6):312-6.